Among congenial companions and under the direction of professionals, top athletes, and future competitive athletes as well as sports interested people hit on an ideal surrounding in Prau La Selva. 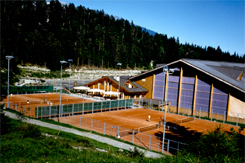 This is not just due to the most favorable infrastructure of the sports center, but also to the surrounding of the sports and recreation area of Alpenarena with its dark blue lakes and infinite forests in the midst of the mountains of Grison. 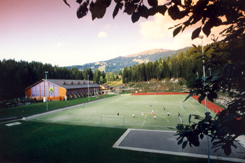 Furthermore, Flims provides a wide choice of accommodation as well as special lodging near the sports center is available for children participating at the Super Summer Camp unaccompanied by their parents. The general objectives of the courses meet an appropriate physical rate of capacity according to age and performance without overstraining the body. According to the standard of performance and the contents of the training, the group sizes are graded individually. Almost all course programs can be combined according to their contents and physical possibilities. According to prior agreement, additional tuition is basically possible, if teaching staff and capacity are available. For administrative reasons, we would like to ask you to mention this on your registration form. The programs of the participants should be essentially finished, the sequence of elements should be decided by their own coach. All courses demand a minimum number of participants. 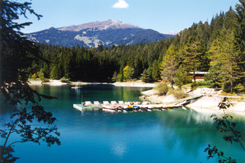 For families wanting to train their mind and body we offer "performance, fun and active relaxation for the whole family" in an alpine scenery. 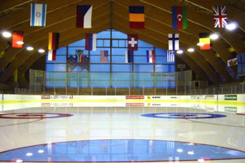 Apart from the sports event there are many social highlights, for instance barbecues on Saturday afternoons as well as a training exhibition for skating followed by a communal dinner in the restaurant of the sports center Prau La Selva, 1st of August (Swiss National Day), etc.